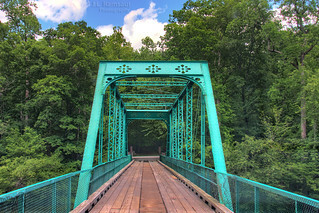 This bridge, located on Campground Road inside Old Stone Fort State Park in Manchester, Tennessee, is a Pratt Through-Truss Bridge and is extended across the Duck River. It was originally built in 1906 by the Joliet Bridge Company at Dabbs Ford over the Elk River on the Franklin-Coffee County line. It was relocated to present location in 1971 and the piers were rehabilitated in 2009. The bridge is also noteworthy for its ornamental portal bracing. The ornamental cutouts in the portal bracing plates were cut out in the era before cutting torches and instead a series of tiny holes were drilled next to each other to cut the metal out. This can be seen looking at the detail of the cutouts. That is a lot of extra work just to produce some ornamentation.